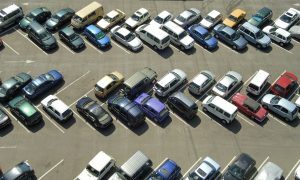 Securing parking lots requires looking at what the biggest vulnerabilities are and taking the time to mitigate some of that risk. Between employees and patrons, it’s important that everyone using a parking facility feels safe when going to and from their vehicle. This risk is especially elevated during evening hours or when there aren’t as many security officials present. Crimes that can occur in a parking facility range from minor theft or vandalism to violent assault, but tackling the root vulnerabilities helps cut down on the likelihood of any crime happening. Below, we take a look at five of the most effective measures that can be taken to secure parking lots. If your parking lot primarily caters to employees, who regularly use the lot, establishing some basic security protocols is always a good idea. Employees ought to know who to call in the event that there is something suspicious. They should also practice good parking lot safety tips, like keeping their phones in their pockets when walking to their vehicle or even walking in groups to their vehicles. These tips are harder to implement in parking lots that are utilized by guests often, but some additional signage can go a long way in informing people. Unfortunately, many parking lots are still relying on legacy CCTV systems that just aren’t up for the job. While even the presence of security cameras can dissuade would-be criminals, the latest and greatest in surveillance technology can add a lot of utility. Take a look at an intelligent driver camera, which can authenticate the identity of anyone entering a parking facility and alert security personnel as to whether or not they should be there. Poor lighting is essentially an invitation to criminals, who can do the things they shouldn’t be much easier in the dark. Investing in better parking lot lighting can reduce the risk of vehicle break-ins and generally go a long way in stopping crime. Preventing access entirely is sometimes a necessity. Some parking facilities are surrounded by high fences or other security structures that are intended to keep out any unwanted access. Gates are also a great way of preventing access during off hours. Security guards are old-fashioned but the fact is that they work. If you have a special event, or increased traffic because of holidays, or any reason that may require increased security, adding some more security personnel than is typical is a great way of keeping a property secured. This entry was posted on Friday, March 22nd, 2019 at 12:20 pm. Both comments and pings are currently closed.